Early last year, Holland began harming himself while in jail, and sheriff’s deputies strapped him naked in a restraint chair for 46 hours. Holland died shortly after deputies released him from the chair and dumped him on the cement floor of the drunk tank, where he succumbed to a blood clot that traveled from his leg to his lung. Following Holland’s death, in an apparent coverup, the sheriff’s office disbursed false information including that Holland likely died of respiratory arrest, that Holland was continually under a physician’s care, that his department followed state laws regarding the treatment of the mentally ill and that medical staff had ordered that Holland remain in the chair. Additionally, the sheriff’s office claimed Holland was out of control and that deputies kept him restrained in the chair because he was uncooperative, claims that were disproven by jail logs, sources and now the video. On Saturday afternoon, dozens of protesters, including San Luis Obispo Mayor Heidi Harmon, gathered outside the SLO courthouse seeking the resignation of Parkinson and District Attorney Dan Dow. Both Parkinson and Dow are currently running for reelection. Also on Saturday, Parkinson issued a statement that “responds to claims” about Holland’s death. Parkinson said in the statement that the sheriff’s followed all rules regarding use of restraints and that any claims otherwise are completely false. While it is unclear whether the sheriff’s office indeed complied with all rules regulating the use of restraints in Holland’s case, inspectors have found that SLO County Jail staff previously violated state regulations. Following previous jailhouse deaths, inspectors from the Institute for Medical Quality found numerous problems with SLO County’s treatment of inmates, including the sheriff’s office use of restraints, such as a restraint chair. According to a 2015 inspector’s report, deputies failed to document reasons for keeping inmates restrained longer than two hours and failed to get a mental health consultation within eight hours of placement in restraints. Those practices violate California’s Title 15 standards for detention facilities. In Holland’s case, jail medical staff said they recommended against placing Holland in the chair. However, deputies would not listen to them. Additionally, the 2015 report revealed that deputies were confining mentally ill inmates in safety cells for a week or longer. Safety cells are small concrete cells with rubber padding, no bedding and a hole in the floor for human waste. Over the month prior to Holland’s death, he was held naked in a security cell for several weeks. 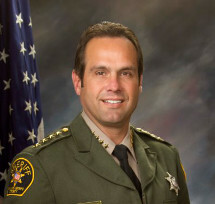 While attributing blame for the death to SLO County’s mental health division, Parkinson said in his statement that the sheriff’s office requested multiple times that Holland be transferred to a mental health facility. However, the mental health division refused to accept Holland, claiming they were already at capacity, when that was not actually the case, Parkinson said. The 2015 inspector’s report likewise noted that SLO County had been violating Title 15 as a result of the mental health facility’s refusal to admit more than a few mentally ill transfers from the jail at a time. As a result, inmates who were ordered by a court to check into a mental health facility often languished in the jail for weeks or months, inspectors found. One aspect of the Holland case that has drawn the ire of many local residents is that the video footage from the jail shows deputies smiling and possibly laughing as Holland was dying. Though protesters and critics have frequently raised that issue, Parkinson did not address it in his statement. “Human life is precious. Jail regulations are intended to protect both inmates and staff from harm and injury. The Andrew Holland case was no exception. The sheriff’s office had no alternative other than to place Mr. Holland in restraints. Use of restraints is strictly regulated by a six-page set of rules about every aspect of this process. Citizens of our county and especially all inmates have every right to expect that the sheriff’s office will follow these rules whenever restraints are used. The sheriff’s office followed these rules at all times during this incident. In accordance with these rules, the entire process was videotaped and careful logs were kept concerning every step in the process. Any claims that the rules about use of restraints were not followed by the sheriff’s office are completely false. The large settlement against the county with the Holland family came from the medical malpractice insurance of county mental health; it was not based on any wrong-doing of the sheriff’s office. Parkinson: you will go down. This all makes sense to me: you’re still employed by SLO county until you complete your golden parachute they handout to totally incompetent, corrupt, and dishonest SLO county administrators. Time to ride your pangas into the sunset.